A stricken container ship is sheltering off the Devon coast after it was holed in the English Channel. The London-based MSC Napoli was stranded about 50 miles off the Lizard, Cornwall on Thursday. A French tug has towed the ship to shelter in Lyme Bay where it is waiting for strong winds to ease before being taken to Portland Harbour in Dorset. Once there, an inspection will be made of the damage to the ship's hull and its 2,394 containers removed. Only a "small proportion" of the cargo, including industrial and agricultural chemicals, is classed as hazardous, according to the Maritime and Coastguard Agency (MSC). The freighter had been en route to Sines in Portugal when cracks appeared in the engine room. They resulted in a 1m by 0.5m (3ft by 1ft 6in) hole on the starboard side of the 275m (900ft) long vessel, and water flooded in. 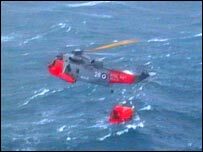 The 26 crew members of the 62,000-tonne vessel were rescued by two helicopters from RNAS Culdrose in ferocious weather conditions. The Nautilus union has called for a full inquiry, saying the incident highlights a number of safety issues. The 16-year-old vessel is owned by owned by the Mediterranean Shipping Company, and registered to London. It was last inspected by the Maritime and Coastguard Agency in May 2005 when officials said it met safety standards.